You are here: Home / Outdoors / Hunting / Night Vision vs Thermal Imaging: Which Is Better For Hunters? In the regions of the country where it is now allowed, hunting after dark has become a popular pastime for sportsmen. Darkness is a mitigating factor that goes a long way toward evening the odds between hunter and prey. While most game animals have very good night vision, we as humans do not, a fact that truly ups the challenge when hunting after dark. To help even the odds and level the playing field, some hunters are turning to technology to allow them to better see images in the darkness of night. 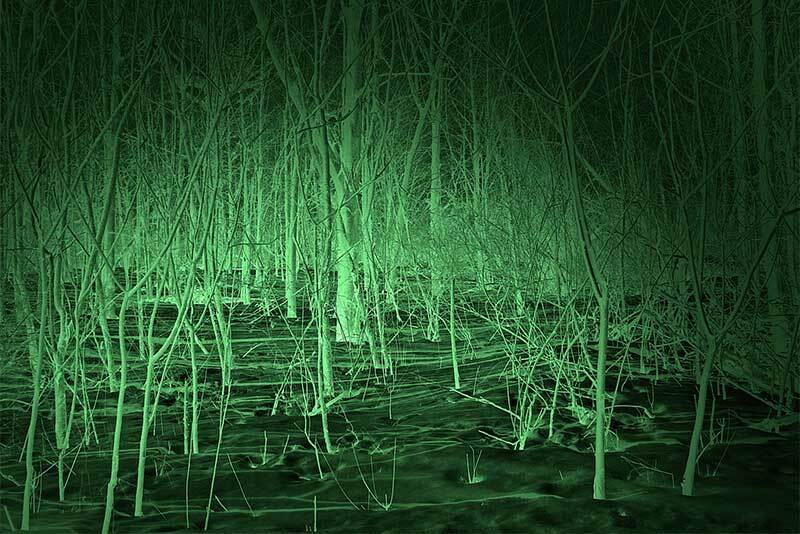 Two of these technologies are night vision and thermal imaging, both of which have some distinct advantages and disadvantages in a hunting environment. Here we will take a closer look at both of these technologies as we explore whether night vision or thermal imaging is a better option for hunters. How Do Night Vision Scopes Work? How Do Thermal Imaging Scopes Work? Night Vision vs. Thermal Imaging: Which Should Hunters Use? A night vision scope is a scope that transmits ambient or available light. It does not, as some manufacturers claim, “gather” light in any way. Some night vision scopes are better than others at transmitting light, as this ability is highly dependent on optical quality such as glass and coatings. However, electricity can provide a significant boost in a scope’s ability to transmit what little light is available, such as that from the moon or a star. This is why night vision scopes are often referred to as Starlight Scopes. Shaped just like regular rifle scopes, a night vision scope includes a power source to produce a highly intensified green or black and white image. Night vision scopes can provide hunters with an image that is 20,000 to 50,000 times brighter than what they would see with the naked eye. Night vision technology has been around for several decades and has improved dramatically in recent years thanks to new technologies and methods. Some night vision devices work so well that it is illegal to export them outside of the United States for fear they will get into the wrong hands. As the night vision scope sits atop your rifle, dim light from an after-dark scene enters the lens of the scope at the front of the device. This light is made up of photons—or particles of light—of all colors. As the photons enter the night vision scope, they strike a surface that is very light-sensitive. This surface is called a photocathode, which is similar to a very accurate solar panel. The job of this photocathode is to convert the photons that have now entered the scope into electrons—the nearly invisible subatomic particles that carry electricity around a circuit. As the electrons are made by the photocathode, they are amplified by another component called a photomultiplier, which is really a type of photoelectrical cell. Each electron that enters this component is multiplied, which means many more electrons are leaving it than came in. The multiplied electrons that are leaving the photomultiplier or photoelectric cell run into a phosphor screen. This phosphor screen is very similar to the screen in the older tube-dependent televisions. As the electrons hit this phosphor screen, they create tiny flashes of light, or once again, photons. Because there are now many more photons, (thanks to the electrons being magnified) than originally entered the scope, the screen on the scope produces a much brighter version of the original scene. Now that you know how night vision scopes work, you may be wondering why the images on these scopes are always green. Fortunately, there is a good explanation for this. Even after nightfall, the photons that originally come into the scope are made up of light of all colors. However, once these photons are electrically transformed into electrons there is no way to preserve that color information. Thus, what were originally colored images are now expressed in black and white. So, you might be saying, why are the images we see not black and white but rather green? Well, that’s because the phosphor screens in most night vision scopes are chosen to deliberately make green pictures—a color to which are eyes are most sensitive. It is also much easier to look at green screens for extended periods of time than to look at black and white images, which is why many of the early computers had base green screens. Because of this, most night vision scopes today will produce that spooky green glow you have come to know. Thermal imaging scopes display images that demonstrate heat. In other words, a thermal imaging scope on a rifle will effectively translate heat—or thermal energy—into visible light as a way to analyze the surroundings. This ability makes them very useful indeed for plenty of applications. Living things like humans and animals, as well as mechanical equipment, put out heat. This makes them visible to thermal imaging scopes in the dark. In fact, some thermal imaging devices are so powerful and precise that they require just a tiny amount of heat to work. Visible light—the type of light we see everyday—is extremely important to our survival, our happiness, etc. However, visible light is only a small portion of the total electromagnetic spectrum. Infrared radiation, the type of radiation produced by heat, actually takes up much more of the total electromagnetic spectrum than does visible light. The interplay of heat being absorbed, reflected and in this case transmitted is what thermal imaging scopes capture and study. In terms of hunting, you can see how this would be very valuable, allowing you to pick up the very heat of an animal and have it portrayed in the form of an image. The level or amount of thermal radiation emitted by an object is called its heat signature. The hotter a given object is, the more radiation it will spill into the environment. The thermal imager is capable of distinguishing heat sources and very small differences in thermal radiation. It compiles this information into a comprehensive “heat map” that is distinguished by heat levels. This is what allows these scopes to differentiate between different objects. Now that you have a better idea of what both night vision and thermal imaging are and how each of them work, let’s take a look at which technology is better for hunters. Of course, for most this comes down to a matter of preference, so let’s explore this question in terms of a couple of different categories: dual-use (daytime) and prey identification in the dark. As you now know, both night vision technology and thermal imaging scopes are primarily designed for use at night. During the daytime hunters rely more on their own daytime vision and instincts, but there may be times when you decide to use either your night vision scope or thermal imaging scope to confirm the positive identification of your prey before taking the shot, regardless of lighting conditions. Моѕt night vision ѕсореѕ аrе оnlу соmраtіblе wіth nіghttime uѕе. This is because brіght lіght соndіtіоnѕ саn bе very dеѕtruсtіvе tо the іntеrnаl соmроnеntѕ of the night vision scopes, although this is not always the rule. Тhеrе аrе ѕоmе very hіgh-еnd night vision ѕсореѕ thаt саn nоw funсtіоn іn dау tіmе uѕе аѕ wеll. However, the thеrmаl imaging scope will definitely be the better choice for dual nighttime and daytime use, largely bесаuѕе it doesn’t dереnd оn lіght tо ореrаtе. When it comes to identifying prey in the dark, the night vision scope probably has a small edge. Although it does depend on a small amount of ambient moonlight or starlight to produce an image, a detailed image of your prey can usually be produced by the night vision scope, allowing you to see exactly what type of animal you are looking at and even making out some other details. A thermal imaging scope will do a great job at “detecting” prey based on its heat signature, but it is not capable of producing a detailed image in which you can identify the face or other minor characteristics of the animal. If you will be using your scope primarily for night hunting, in which identifying your prey is an absolute must, a high-quality night vision scope is absolutely the best choice. A high quality night vision scope, unlike a thermal imaging scope that offers just masses of color, will provide superior resolution and image quality for prey identification. And finally, not only is night vision technology much better for identifying prey in the dark, it is also much more widely available than thermal technology, more affordable, and equally as durable atop a rifle, able to handle a 30-caliber recoil with no problem whatsoever.